The United States court system comprises a federal system and 50 state systems. Within each of these systems, the courts are generally divided into three levels: trial courts, intermediate appellate courts and courts of last resort. Article III of the US Constitution allows only certain kinds of cases to be heard by the federal courts. In general, these courts are limited to cases that involve issues of US constitutional law, certain disputes or suits between citizens of different states,2 disputes or suits between US citizens and non-US citizens, and issues that involve federal law. The trial court level comprises 94 district courts. There is at least one federal district court in each state. Some less populous states, such as Alaska, have only one district court. More populous states, such as California and New York, have multiple district courts within the state.3 Within each district court there are multiple district court judges.4 Bankruptcy courts are separate units of the district courts. There are also two special trial courts that have nationwide jurisdiction over certain types of cases: the Court of International Trade, which hears cases involving international trade and customs issues; and the Court of Federal Claims, which hears cases involving claims for money damages against the United States, disputes over federal contracts, unlawful ‘takings’ of private property by the federal government and a variety of other claims against the United States. Decisions of the federal district courts are appealed to a federal circuit court of appeals. There are 13 circuit courts of appeal. Each federal circuit court of appeals hears appeals from multiple district courts.5 For the most part, courts of appeal comprise districts that are geographically close to one another.6 The exception is the Federal Circuit Court of Appeals, whose jurisdiction is based wholly on subject matter rather than geographical location. The Federal Circuit Court of Appeals hears all appeals from any of the federal district courts in which the action included a complaint arising under the patent laws. The Federal Circuit Court of Appeals also hears all appeals from the Court of International Trade and the Court of Federal Claims. District court judges, courts of appeal judges and Supreme Court justices are nominated by the President of the United States and, after hearings by the Senate Judiciary Committee, confirmed by the United States Senate. Each state has its own court systems, governed by its state Constitution and its own set of procedural rules. As a result, it is very important, in practice, to check each state’s rules and procedures, as they may vary from state to state in significant respects. As in the federal system, cases in state court begin at the trial court level. Many states have specialised trial courts that hear cases related to a very specific area of the law. These courts can include probate courts, family law courts, juvenile courts and small-claims courts. The state of Delaware is notable in the area of corporate law. Delaware is the favoured state of incorporation for US businesses, with over half of the Fortune 500 companies claiming Delaware as their legal ‘home’. Delaware has a special court, the Court of Chancery, devoted to hearing cases involving corporate law disputes. These cases are heard by judges (called ‘chancellors’ or ‘vice chancellors’) who specialise in corporate law. As a result, the Delaware courts are viewed as having particular expertise in the area of corporate law, and the decisions of the Delaware courts are closely watched, both in the United States and overseas. ADR mechanisms include arbitration and mediation. ADR mechanisms are used by mutual agreement of the parties.11 They are discussed in more detail below. Notable decisions of 2017 include the following cases. The Supreme Court ruled in favour of plaintiff, concluding that (1) trademark registration is not government speech;16 and (2) trademark registrations are not a form of government subsidy.17 Accordingly, the Court concluded that the Lanham Act’s disparagement clause was unconstitutional in violation of the First Amendment. In Kindred Nursing, the Supreme Court was asked to consider a Kentucky state law that provided an agent could bind her principal to an arbitration agreement—implicitly waiving the principal’s state constitutional rights to a jury—only if the principal expressly granted her agent the authority to do so. Estate representatives of two deceased individuals had brought claims in Kentucky state court against Kindred Nursing on behalf of the decedents’ estates, arguing that Kindred Nursing had delivered substandard care to their relatives.19 Kindred Nursing moved to dismiss the cases, on the ground that the estate representatives had signed arbitration agreements on behalf of their decedents’ estates. According to Kindred Nursing, those arbitration agreements required the parties to arbitrate their disputes and prohibited courts from hearing the disputes. Notwithstanding the arbitration agreements, the Kentucky Supreme Court sided with the plaintiffs and held that the underlying claims could be heard in court. The Kentucky Supreme Court reasoned that the Kentucky state constitution protects an individual’s rights to trial by jury and to access the courts, and that those rights could be waived by an agent on behalf of a principal only if the principal explicitly provides the agent with that authority. Because the deceased individuals did not expressly grant their estate representatives authority to waive their rights to trial, the arbitration agreements signed by the estate representatives could not preclude their claims from being heard in court. In Nelson, the Supreme Court considered whether the US Constitution requires a state to refund fees, court costs and restitution paid by a defendant in connection with a conviction that was later overturned and not subject to retrial. The Supreme Court rejected the petitioner’s argument, holding that – consistent with prior Supreme Court precedent – a tipper breaches his fiduciary duty by making ‘a gift of confidential information to a trading relative or friend’ and that, on the present facts, the Court could infer a personal benefit to the tipper.28 The Supreme Court therefore concluded that the petitioner was properly convicted of insider trading notwithstanding the fact that the tipper did not receive anything of pecuniary value in exchange for disclosing the inside information. The procedures used in federal district courts are set forth in the Federal Rules of Civil Procedure (FRCP).30 The Federal Rules of Appellate Procedure (FRAP) govern the procedures used in the courts of appeal,31 and the Rules of the Supreme Court govern Supreme Court procedure. Following the completion of discovery, including discovery related to expert witnesses, if any, a case proceeds to trial. Depending upon the type of claims involved, the trial may be conducted before a judge or jury. The right to a jury in civil cases is provided by the Seventh Amendment to the US Constitution, which preserves the right to a jury for ‘suits at common law’. Generally speaking, suits at common law involve claims for monetary damages, as opposed to claims for equitable, non-monetary damages, such as injunctions. Prior to a trial, the FRCP provide for forms of interim relief upon a proper showing by the moving party. Under FRCP 65, a court may issue a preliminary injunction, prior to a full trial on the merits, where a plaintiff shows that it will sustain irreparable harm (i.e., harm that cannot be remedied by monetary compensation) if an injunction does not issue. Class actions are permitted in the United States and are expressly authorised under FRCP 23 and various state law analogues. Class actions may be permitted ‘only if’ the case involves plaintiffs so numerous that it would be impractical to bring them all before the court; there are questions of law or fact common to the class; the claims or defences of the representative parties are typical of the claims or defences of the class; and the representative parties will fairly and adequately protect the interests of the class.43 In addition, even assuming that the foregoing prerequisites to maintaining a class action are satisfied, FRCP 23(b) imposes additional requirements regarding the permissible types of class actions. The right of self-representation is long-standing.44 The US Judiciary Act, the Code of Conduct for United States Judges, the Federal Rules of Civil Procedure, the Federal Rules of Criminal Procedure, the Federal Rules of Evidence and the Federal Rules of Appellate Procedure address the rights of the self-represented litigant in several places. In some situations, self-represented appearances are not allowed. For example, an owner may represent a solely owned business or partnership. However, only a licensed attorney may represent a corporation. Rule 4 of the FRCP applies to natural persons as well as corporations. The United States is not a signatory to any treaty that requires the recognition or enforcement of foreign judgments.46 Nor is there any constitutional basis or federal statute requiring a foreign court judgment to be given full faith and credit by US federal courts. Procedurally, the holder of a foreign judgment or decree may file suit before a competent US court, which will determine, in accordance with the principles of international comity, whether to recognise and enforce the judgment. Centuries ago, litigation funding by third parties was forbidden. Champerty (providing a party to litigation money in exchange for a share of the proceeds) and maintenance (providing a party money to continue the litigation) were offences at common law. Today, rules governing third-party funding of litigation are more flexible.54 Although still not common, third-party litigation financing – the practice of providing money to a party to pursue a potential or filed lawsuit in return for a share of any damages award or settlement – is becoming more prevalent in the United States. Under these arrangements, litigation-financing companies may provide financing for a variety of litigation costs, including attorneys’ fees, court fees and expert-witness fees. The rules governing these financial arrangements vary from state to state, with some states still strictly prohibiting such arrangements. Generally, a conflict of interest is present if ‘(1) the representation of one client will be directly adverse to another client; or (2) there is a significant risk that the representation of one or more clients will be materially limited by the lawyer’s responsibilities to another client, a former client or a third person or by a personal interest of the lawyer’.59 Notwithstanding the foregoing, MRPC 1.7(b) does allow an attorney to represent a client despite the existence of a conflict of interest if certain conditions are met. Both clients must consent to the conflict after full disclosure.60 Under what is sometimes called the ‘firm unit rule’, all lawyers of a firm are typically disqualified because of a current client conflict if any lawyer is disqualified.61 In some jurisdictions, ‘ethical walls’ allow firms to avoid disqualification if the conflict is a result of work done by a laterally hired lawyer before he or she joined his or her present firm. Title III of the USA Patriot Act, International Money Laundering Abatement and Financial Anti-Terrorism Act of 2001, is intended to facilitate the prevention, detection and prosecution of international money laundering and the financing of terrorism. It amends portions of the Money Laundering Control Act of 1986 and the Bank Secrecy Act of 1970 (BSA).62 The BSA and the USA Patriot Act cover ‘financial institutions’ and require such entities to have anti-money laundering programmes and customer identification programmes. There are some exceptions to the application of the attorney–client privilege. For example, communications in furtherance of a crime or fraud, or the post-commission concealment of the crime or fraud, are not privileged. A corporation’s right to assert the attorney–client privilege is not absolute; an exception to the privilege applies when the corporation’s shareholders wish to pierce the corporation’s attorney–client privilege. In addition, if two parties are represented by the same attorney in a single legal matter, neither client may assert the attorney–client privilege against the other in subsequent litigation if the subsequent litigation pertains to the subject matter of the previous joint representation. This latter exception is known as the ‘common interest’ exception. Another important consideration is that of waiver: privileged communications that are disclosed to third parties are often deemed ‘waived’ and no longer protected from disclosure to others. In addition, certain other communications between an attorney and a client may not fall within the privilege because they do not pertain to legal advice. For example, the general nature of the services performed by the lawyer, including the length of the retention, are generally not immune from disclosure. Complications may arise with respect to communications with in-house counsel. A communication relating to corporate legal matters between a corporation’s in-house counsel and the corporation’s outside counsel is normally protected by the attorney–client privilege.70 However, when the communication is between a representative of the corporation and the in-house lawyer, the privilege extends only to any legal advice sought or rendered; it does not protect communications that are strictly business-related. Disclosure of work product materials to a third party (other than the client) may not waive the protection afforded under this doctrine, as long as the receiving party shares a ‘common interest’ with the disclosing party (e.g., both parties are defendants in pending litigation). However, materials protected from disclosure by the work product doctrine may be subject to disclosure under certain circumstances. Under Rule 26(b)(3)(a) of the FRCP, materials protected by the work product doctrine may be discoverable if the opposing party shows a ‘substantial need for the materials to prepare its case and cannot, without undue hardship, obtain their substantial equivalent by other means’. FRCP 26(b)(1) permits discovery of ‘any nonprivileged matter that is relevant to any party’s claim or defense and proportional to the needs of the case, considering the importance of the issues at stake in the action, the amount in controversy, the parties’ relative access to relevant information, the parties’ resources, the importance of the discovery in resolving the issues, and whether the burden or expense of the proposed discovery outweighs its likely benefit’. The FRCP provide a full range of pretrial discovery devices, including discovery of expert opinions, depositions, interrogatories, production of documents, inspections and requests for admissions.73 Parallel state codes of civil procedure provide for similar discovery devices, generally on liberal grounds of relevance. A party must produce all documents responsive to a document request that are in the party’s ‘possession, custody, or control’.74 That documents are located in a foreign country does not bar their discovery. Rather, it is the determination of the ‘control’ issue that dictates the outcome. If a domestic parent corporation, for example, is deemed to control its foreign subsidiary (because, for example, the parent controls the board of directors of its subsidiary), then the domestic parent may be compelled to produce documents located at its foreign subsidiary’s offices. Failure of a party to produce relevant documents, or failure to preserve relevant evidence once a lawsuit is commenced or litigation becomes reasonably imminent, may result in severe sanctions for the party and the party’s counsel.80 Recent court decisions have imposed harsh penalties on parties, as well as their lawyers, for failing to preserve and produce relevant documents. Given the time, disruption and expense associated with litigation, some parties opt to settle their disputes out of court through alternative dispute resolution procedures. Arbitration and mediation are the most common alternatives. Arbitration is the submission of a dispute to one or more impartial persons for a final and binding decision. Through contractual provisions or other agreement, the parties may control the range of issues to be resolved, the scope of relief to be awarded and many procedural aspects of the process, including the location of the arbitration, the language in which the hearing will be conducted and the length of the hearing. In the United States, agreements to arbitrate are enforced (in the absence of special circumstances, such as showing of fraud) under the Federal Arbitration Act. Parties may elect to arbitrate their claims with the assistance of recognised arbitral instructions, such as those of the International Chamber of Commerce or the American Arbitration Association, or the parties may devise their own set of rules for how the arbitration will be conducted. 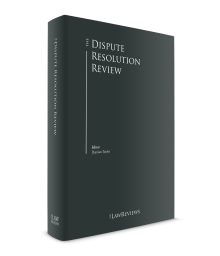 The arbitration process generally offers parties cost-effectiveness owing to its speed relative to a traditional lawsuit. Parties, in a contractual arbitration provision, may predetermine the qualifications and experience of an arbitrator. Many arbitration provisions specify that the parties shall agree upon a mutually acceptable arbitrator. Unlike judges, who are randomly assigned cases without regard to background or expertise, arbitrators are often designated or chosen precisely because they have particular expertise in the matters to be arbitrated. In addition, unlike court proceedings, arbitration proceedings are confidential, with no right of public access. Arbitration proceedings may be completed in a matter of months, resulting in lower attorneys’ fees and other expenses, through a reduced emphasis on evidentiary processes. In particular, arbitration procedures typically provide less opportunity for discovery, including a more limited exchange of documents, fewer (if any) depositions and little or no written discovery (such as interrogatories and requests for admission). Arbitration awards are binding and are vacated only under limited circumstances, as outlined in state and federal arbitration laws. Once an award is entered by an arbitrator or arbitration panel, it must be ‘confirmed’ in a court of law. Once confirmed, the award is then reduced to an enforceable judgment, which may be enforced by the winning party in court like any other judgment. In the international context, enforcement of foreign arbitral awards is governed by the provisions of the Convention on the Recognition and Enforcement of Foreign Arbitral Awards, known as the New York Convention. US courts will not enforce foreign arbitral awards under the Convention where the award is made in a state that is not a party to the Convention or does not reciprocally enforce US awards.82 Generally speaking, however, arbitration awards are more easily enforced than judgments of foreign courts. There are some drawbacks to arbitration. Most notably, there generally is no right of appeal of an arbitrator’s award. In addition, the truncated discovery mechanism that is often used in arbitration may limit a party’s ability to discover evidence in the possession of an adversary that would be important in litigating the case. Mediation is a voluntary process in which parties to a dispute work together with a neutral facilitator – the mediator – who helps them reach a settlement.83 Unlike litigation or arbitration, mediation is not an adversarial process. The mediator does not decide the case. The results of mediation are binding if and when parties enter into a settlement contract. A mediation process can be scheduled at any time during arbitration or litigation. Parties generally save money through reduced legal costs and less staff time. Like arbitrators, mediators are often selected on the basis of their specialised expertise in the issues subject to mediation. Generally, information disclosed at a mediation may not be divulged as evidence in any subsequent arbitral, judicial or other proceeding. The Supreme Court has several interesting cases on its docket for the upcoming year. For example, in Rubin v. Islamic Republic of Iran, the Supreme Court will determine whether the Foreign Sovereign Immunities Act (FSIA) allows terrorism victims to seize any assets of a foreign state after securing a default judgment against that state for sponsoring terror, or whether the FSIA allows a judgment creditor to seize only those assets that have been used for commercial activity in the United States. In Carpenter v. US, the Court will decide whether law enforcement officers need a warrant84 (which requires a reasonable basis to believe that a crime may have been committed) to obtain historical cell phone records from wireless carriers revealing the movements and locations of a cell phone user, or whether courts may apply a less exacting standard requiring only that there be ‘reasonable grounds to believe that the contents of a wire . . . are relevant and material to an ongoing criminal investigation.’85 In Janus v. American Federation of State, County, and Municipal Employees, the Court will re-examine whether the First Amendment prohibits public employers from requiring non-union employees to pay a fee to help pay the union’s collective bargaining costs, where the union negotiates contracts that would apply to all public employees regardless of union membership. 1 Timothy G Cameron is a partner, and Lauren R Kennedy, Daniel R Cellucci and Alex B Weiss are associates, at Cravath, Swaine & Moore LLP. 2 A corporation, whether domestic or foreign, is deemed a citizen of both its state of incorporation and the state in which its principal place of business is located. See 28 USC Section 1332(c)(1). 3 New York, for example, has four districts: the Southern, Northern, Eastern and Western Districts. 4 For example, in the US District Court for the Southern District of New York, which is one of the four federal district courts in the state of New York, there are currently 27 active judges. 5 For example, the Court of Appeals for the Second Circuit hears appeals from the federal district courts in the Southern, Northern, Eastern and Western Districts of New York, as well as the District of Connecticut and the District of Vermont. 6 For example, the Court of Appeals for the Ninth Circuit generally encompasses districts in the western portion of the United States. 7 For example, the Supreme Court has original jurisdiction over disputes between two or more states. 8 During the 2016 term, for example, the Supreme Court heard argument in 71 cases. https://www.supremecourt.gov/publicinfo/year-end/2017year-endreport.pdf. 9 Even the nomenclature varies from state to state. New York, for example, has a three-tier court system. But the lowest level, the trial court level, is called the Supreme Court, the intermediate appellate level is called the Appellate Division and the court of last resort is the New York Court of Appeals. 10 In 2009, the Supreme Court held, in Caperton v. Massey, 129 S Ct 2252 (2009), that the due process clause of the US Constitution may require a judge to recuse himself or herself under certain circumstances, including in the context of an election campaign. The Court found ‘that there is a serious risk of actual bias – based on objective and reasonable perceptions – when a person with a personal stake in a particular case had a significant and disproportionate influence in placing the judge on the case by raising funds or directing the judge’s election campaign when the case was pending or imminent’. Id. at 2263–64. 11 Many commercial contracts, for example, contain express provisions to submit any claims arising from the contract to arbitration, rather than court litigation. 12 137 S Ct 1744 (2017). 13 15 USC Section 1052(a). 14 US Const amend I. 15 Matal, 137 S Ct at 1757, 1761. 18 137 S Ct 1421 (2017). 21 137 S Ct 1249 (2017). 23 US Const amend XIV Section 1. 25 137 S Ct 420 (2016). 28 Id. at 427 (citing Dirks v. SEC, 463 US 646 (1983)). 29 State court procedures are similar in many respects, but each of the 50 states has its own set of procedural rules. 30 In addition, each individual federal district may promulgate rules to supplement, and in some instances to modify, the FRCP, and each individual judge within each district may promulgate rules governing proceedings in his or her courtroom. 31 Each Circuit Court of Appeals may promulgate its own rules to supplement the FRAP. 34 See FRCP 12. The time within which to serve the answer is provided in Rule 12(a) and varies from 21 days to 90 days (in the case of a defendant who was served outside the United States) (FRCP 12(a)). In practice, extensions of these periods are often obtained. 36 Depositions typically involve live testimony given under oath. See FRCP 30. Under limited circumstances, depositions may be conducted by submitting questions to the deponent in writing in advance of the deposition. See FRCP 31. 38 See FRCP 33 (providing that a party may serve written ‘interrogatories’ (i.e., questions) on any party, and requiring the party upon whom the interrogatories are served to answer them); FRCP 36 (providing that a party may, in writing, request the other party to admit, among other things, ‘facts, the application of law to fact, or opinions about either’). 39 Recently adopted amendments to the Federal Rules of Civil Procedure attempt to reduce the burden of discovery by, among other things, scaling back the scope of permissible discovery by adopting the ‘proportionality rule’, pursuant to which the scope of discovery sought must be proportional to the needs of the case, considering the amount in controversy, the importance of the issues at stake in the action, the parties’ resources, the importance of the discovery in resolving the issues, and whether the burden or expense of the proposed discovery outweighs its likely benefit. The amendments also limit the use of depositions (FRCP 30) to reflect the ‘proportionality rule’ of FRCP 26. 40 28 USC Section 1407(c). 44 See Faretta v. California, 422 US 806, 812 (1975) (‘In the federal courts, the right of self-representation has been protected by statute since the beginnings of our Nation.’). 45 The Supremacy Clause of the US Constitution pre-empts all US laws and rules to the contrary. See Volkswagenwerk Aktiengesellschaft v. Schlunck, 486 US 694, 699 (1988). 46 However, many of the individual 50 states in the United States have adopted the Uniform Foreign Money-Judgments Recognition Act (UFMJRA). 47 Hilton v. Guyot, 159 US 113, 202 (1895). 48 See Intel Corp v. Advanced Micro Devices Inc, 542 US 241 (2004). 49 Nixon v. Warner Communications Inc, 435 US 589, 597–99 (1978). Some states have ‘sunshine laws’ that recognise, and in some instances expand, this right. 50 See US v. Amodeo, 71 F3d 1044, 1048 (2d Cir 1995). 51 See Seattle Times Co v. Rhinehart, 467 US 20 (1984). 52 See FRCP 26(c) (protective orders). 53 Many courts that permit filing to be made under seal require that a ‘public’ version of the document be filed with the court. These public versions redact information that is protected from disclosure, such as financially or commercially sensitive information. 54 The issue of litigation funding was addressed by the Supreme Court in 2008 in Sprint Communications Co v. APCC Services Inc, 128 S Ct 2531 (2008). There, the Court held that an assignee of a legal claim for money had standing to pursue that claim in federal court, even when the assignee had promised to remit the proceeds of the litigation to the assignor. Id. Noting that, prior to the 17th century, a suit like the one before the court would not have been allowed, id. at 2536, the Court went on to trace the history of assignment of legal claims and concluded that ‘history and precedents [. . .] make clear that courts have long found ways to allow assignees to bring suit’. Id. at 2541. The Court held that ‘lawsuits by assignees, including assignees for collection only’, are ‘cases and controversies of the sort traditionally amenable to, and resolved by, the judicial process’. Id. at 2542. 62 31 USC Section 5311 et seq. 63 26 USC Section 6050I. 64 Upjohn Co v. US, 449 US 383, 389 (1981). 66 See McCormick on Evidence Section 87, n.19 (7th ed, June 2016). 67 Id. at Section 89. Thus, a party cannot conceal a fact from disclosure merely by communicating it to his or her lawyer. ‘A fact is one thing and a communication concerning that fact is an entirely different thing.’ Upjohn Co, 449 US at 395–96. 68 See McCormick on Evidence Section 87.1 (7th ed, June 2016). 70 See Upjohn Co v. US, 449 US 383 (1981). 71 Hickman v. Taylor, 329 US 495, 510 (1947). 77 See, for example, Zubulake v. UBS Warburg LLC, 217 FRD 309, 318 (SDNY 2003) (‘undue burden’ should turn on whether the information sought is kept in ‘accessible’ form); see generally The Sedona Principles: Best Practices Recommendations & Principles For Addressing Electronic Document Production (June 2007), Principle 2 (‘cost, burden, and need’ for electronic data must be balanced); Principle 8 (‘primary source’ of electronic data should be ‘active’ data; resort to disaster recovery backup tapes should be required only upon a showing of need and relevance that outweigh the cost and burdens of retrieval). 78 See Zubulake v. UBS Warburg LLC, 220 FRD 212 (SDNY 2003); see also The Sedona Guidelines: Best Practice Guidelines & Commentary For Managing Information & Records in the Electronic Age (November 2007), Guideline 5 (‘An organization’s policies and procedures must mandate the suspension of ordinary destruction practices and procedures as necessary to comply with preservation obligations related to actual or reasonably anticipated litigation, government investigation or audit.’). 79 See Chin v. Port Auth of New York, 685 F3d 135, 162 (2d Cir 2012). 81 See Restatement (Third) of Foreign Relations Law Section 442(1)(C)(1987). 82 See Convention on the Recogition and Enforcement of Foreign Arbitral Awards art XIV, 10 June 1958, 21 UST 2517, 330 UNTS 38. 83 There are numerous private organisations that offer mediation services. 84 A warrant is a court order giving law enforcement permission to search one’s body or property for evidence. With a few exceptions, evidence obtained from a warrantless search is inadmissible at trial. 85 18 USC Section 2703(d).